I cannot tell you how much I’m enjoying my Happy Planner this year! I love having one spot for all my daily to-do’s and reminders. Every Friday night I take about 15-20 minutes to plan for the weekend and upcoming week. 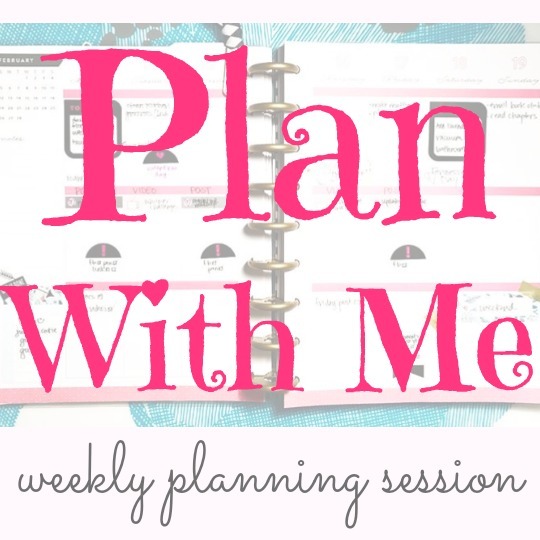 I’ve enjoyed watching other “plan with me” type videos on YouTube, just to see how other people use functional stickers to make their planning more effective. I usually find that I have a little bit of creative energy on Friday nights, so setting up my planner for the next week is a very productive way to use up that energy! also – I love having my to-do lists for household chores and blogging all in the same place! But why just tell you when I can show you? Here’s a peek at last weekend’s planning session! I love using a paper planner! Trying to catch up on you blog, can’t wait to watch your planner video. I can’t live without my planner! I agree – I use digital planning for remembering family birthdays and things like that, but they always get copied into my weekly spread on my paper planner as well. I’ve been wanting to ask if you are the only one cleaning your house and cooking all the meals ? My husband and I both work full time jobs, and I’ve tried keeping up with everything and I just can’t do it all by myself. How do you get it all done? Thank you for your encouragement! I have such high aspirations, I think I need to show myself some grace. So fun. I have really fallen away from using my planner in 2017 other than writing down blog post ideas, that’s just about all I use it for and that makes me kind of sad :(. That is sad!! I’ve had periods of time like that too, though.